⚠️ Passionate DJ is supported via Patreon. 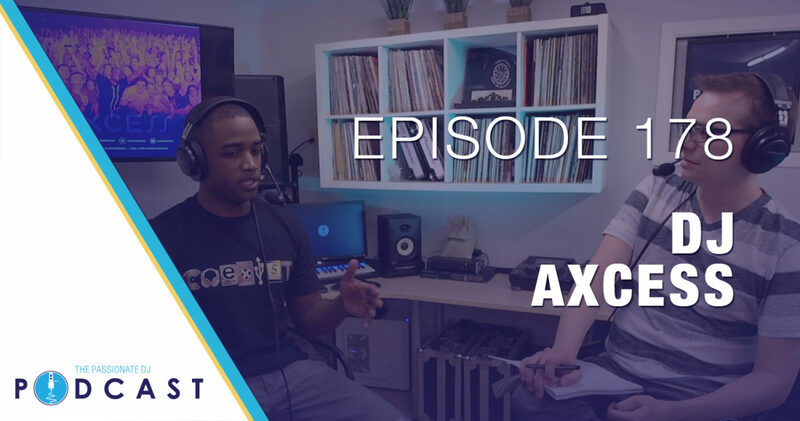 In today’s episode we speak with Mike Salone, also known as DJ Axcess. Mike is a busy guy to say the least: he plays 40-50 weddings a year, hosts loads of corporate events (with a specialty in sports), and has worked with clients such as NCAA, The Ohio State University, IBM, Target, and many more. Not only that, but he has an impressive club and festival resume, having performed alongside artists like Boyz II Men, Kesha, Martin Garrix, Steve Aoki, Skrillex, Claptone, 3LAU, and Nicole Moudaber. He’s made appearances at Breakaway Music Festival, Haunted Fest, Number Fest, Ohio State Welcome Concert, and Buckeyethon. It was fun to talk to Mike about “DJ Axcess the service” vs. “DJ Axcess the artist”. We talk a bit about gear, including his current preferred setup: the Rane Twelves and the Rane Seventy-Two mixer. We also talk about how he uses SoundSwitch to control impressive-looking visuals that work in perfect sync with his music. Finally, we also discuss streaming, Tidal, YouTube, and how all these things currently factor into our DJing. This episode is loaded full of golden nuggets, and for as many topics as we covered, we end up going pretty deep into several.